I saw this video from one of my favorite blogs and I can't stop being amazed. Arguably, the world's farthest basketball shot ever converted at estimated 140 feet. Thanks to Chico for this. I do believe that I play best when I like what I am wearing, be it my favorite sport shirt, a newly purchased basketball shorts or even favorite accessories like wrist bands and head bands. Much to my amazement, even undershirts and undertrunks can now be designed not only to allow me move freely playing sports but as a support for my whole body. 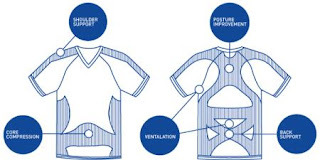 Undergarment designers, like Equmen, now consult with physical therapists and employ advance proprietary technology to make a simple undershirt fit well to our bodies and at the same time, support our natural body structure. That means wearing these kind of undershirt called Core Precision Undershirt, help us lessen body & back pains we normally get after a long basketball or badminton game, improve blood circulation, and stay comfortably dry & germ-free. This is a shirt that I really need! What's more I like about these kind of undershirts is that they are not simply for sports activities. I have a very bad posture, almost always stooping or shoulders-hunched. I am glad that all is not lost for me in that area. Wearing one of these undershirts can really help me obtain proper body posture that I really long for. Whether I'm shooting hoops with friends or smashing shuttlecocks with my office buddies, I am glad that my body will be supported with this kind of undershirt. Or even when I'm just doing my daily routine, I am thrilled that my posture can be improved. I like my undershirt to go with an underwear of the same make. Equmen's Precision Long Trunks looks ideal for heavy-sweat playing because its unique design promises an all-game comfort and anti-bacterial too! My playing buddies surely need to watch out when I wear a new set of sports undergarment in our next game. I can confidently go all-out because I'll be less afraid of injuring myself or post-game pains. Defending Champions Ateneo De Manila University Blue Eagles faced an inspired University of the East Red Warriors before prevailing 80 - 73 to end the first round of eliminations of the ongoing UAAP Season 73 Senior's Mens basketball tournament. Boosted by their first win, the UE Red Warriors kept the Defending champion in check even leading at the end of 3 quarters before succumbing to a superior ADMU line up in the end game. With the likes of Acibar, Razon and Resopa contributing, apart from the expected production of Paul Lee, James Martinez & Raffy Reyes, the Red Warriors almost upset the three-peat seeking Eagles. Eric Salamat opened the fourth quarter with two treys, before Monfort's own triple gave the lead to Ateneo 66 - 65. The downfall of UE started when Sam Razon, playing the best game of his career yet as a Warrior, fouled out before giving UE its last taste of the lead after an end one play, 69 - 66. The win gave ADMU a 5 - 2 win-loss card to finish the first round tied in second place with Adamson University who earlier defeated DLSU. With the loss, UE's hope of reaching Final Four grew slimmer. They would need at least 6 wins in the second round to even have a chance at the last final four seat. But they could draw motivation from this game that they almost upset the defending champions. Formerly unknown, Jundel Mazon came from behind to beat local bet Irsal Nasution 10 - 5 to capture the 2010 Guiness World Series of Pool 10 Ball Billards championship in Jakarta, Indonesia. On his way to the finals, Mazon defeated first World Ten Ball champion Darren Appleton of Britain and Naoyuki Oi of Japan. Mazon of the Philippines upstaged famous compatriots Ronato Alcano and Alex Pagulayan, emerging as another new cue artist to watch for. At the same time, strengthening the Philippines as a superpower in the sport. A month ago, Django Bustamante added the prestigious World 9-Ball Championship crown to his hall-of-fame Billiards career in Doha, Qatar. Mabuhay ka Jundel! Go Team Philippines! So, Jundel Mazon's triumph at espn star sports. Details from teampilipinas.info. Juan Manuel Marquez retained his lightweight world title in a rematch against Juan Diaz in a one-sided boxing clinic of a fight. Marquez won via unanimous decision 118 - 110, 117 - 111, 116 - 112 and retained the title he took away from Diaz himself in the bout last year that became Fight of the Year 2009. Having no other sports to watch, I switched to the local telecast of this Marquez-Diaz fight. But I just saw how a great ring tactician that Marquez is totally dominated the younger Diaz. I think it was in the 10th round that Diaz showed some energy off his feet. But there was no rally or any thing of that sort that happened. As for Juan Manuel Marquez, he still yearns for another shot at Manny Pacquiao. Any trained body emerges above a wonder.